Today the Brewers confirmed the call-ups of the three players I reported yesterday afternoon. In that linked piece, I mentioned that the resultant fallout to open up the necessary pair of 40-man roster spots could be interesting. Looks like I was right again. The additions of two players who earned spots comes at the expense of two who had previously done the same. Designated For Assignment was Caleb Gindl. Should he clear waivers, it’s a virtual certainty that Gindl would choose to leave the Brewers organization. He has talent but was never afforded a consistent opportunity to showcase himself at the game’s highest level. And since his last chance, he’s been passed on the organizational depth chart by Khris Davis and bumped further down with the acquisition of Gerardo Parra who should return for 2015. Gindl can be traded during the DFA period as well, but cannot technically refuse an outright assignment to Nashville as he has not been removed from a 40-man roster before in his professional career. In my opinion, there’s a spot for Gindl on a Major League roster somewhere, but in Milwaukee it just came down to a matter of available space. There just wasn’t enough. The other player lost, in his case to outright release, was right-handed pitcher Hiram Burgos. The professional story of Burgos is one to behold, as he pitched his way from High-A ball to being on alert as the “next-guy-if-we-need-someone-in-September” all in just 2012. I’ve chronicled that on the blog before, if you’re interested in reading about it. 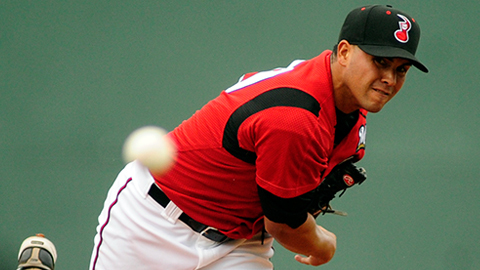 Burgos pitched well in 2013 winter ball, but after a rough start to his season as lead dog in the Triple-A affiliate Nashville Sounds rotation, Burgos underwent a “clean up” procedure on his throwing shoulder on June 19th. His season was done, and now we know so was his tenure in the Milwaukee Brewers organization. Bottom line: The Brewers needed two spots and guys have been removed off of 40-man Rosters for lesser reasons than “too much depth at one position” and “growing injury history”. That doesn’t make it less impactful to the lives of the men and families behind the names on a transaction page, but at the end of the day it’s a business. To Caleb Gindl and Hiram Burgos, two players that have always been gracious where I’m concerned, I wish them the absolute best in continuing their careers outside the Brewers’ organization. Carlos Gomez says he learned after last night’s game that his appeal of his three-game suspension will be heard this coming Monday, May 5. This tweet came over the wire not too long ago. What it means is that during the business day (so before the Brewers scheduled game that night is played), Gomez will have his appeal heard and decided upon. Gomez can be in New York for the hearing because whatever suspension remains — be it all three games or a reduced punishment — will be served starting immediately. Gomez won’t get off without some suspension, so losing the Monday night series opener at Miller Park against the Arizona Diamondbacks is a guarantee. That’s why El Potro can be in New York for the hearing without worry. What it also means is that the entirety of his suspension will be served during the series with the Diamondbacks. That probably couldn’t be better news for the Brewers. The D’backs, who as of this writing at the polar opposite of the Brewers in several respects, only have nine (9) wins on the season against 22 losses. The Brewers were the first (and as of “Publish” time, the only) team in MLB with 20 wins this season. You guessed where I’m going next. The Diamondbacks are the first team to 20 losses in MLB this year and (as of publishing) are still the only. Houston teeters at 19 as faces Seattle next. So whether Gomez misses three games, two, or somehow one, he’ll be back for the start of the Milwaukee stop on the Derek Jeter Farewell Tour on Friday, May 9th. The games on 5/5-5/7 though will force the Brewers hand on something else, in my opinion, if they haven’t already made a decision by then. If Braun still isn’t available by Mon (and they haven’t DL’d him already), they almost need to. Brewers need Schafer in CF with Gomez out. Put more verbosely than the 140 character format of Twitter allows, I’m saying that if Braun still isn’t healthy enough to play and they haven’t already placed him on the disabled list before Monday, they’ll almost have to do so in order to make sure they have enough outfielders to play all three spots as well as having Logan Schafer on the 25-man roster to start in centerfield. If Braun goes on the DL after tonight’s game so Milwaukee can activate Schafer on the first day he’s eligible to return, then fine. If Braun thinks he’ll be able to play soon and they option the just-recalled Caleb Gindl to get Schafer back up, that’ll work, but then they’d be playing with only two true OFs if Braun still isn’t ready by Monday. My point is that Schafer will be on the field on Monday, May 5th one way or the other (unless he somehow reinjures himself before then). It’s just a matter of how the Brewers want to create the 25-man roster space for him. The D’backs are pretty punchless this season, especially with Mark Trumbo on the DL, but the fly ball outs still need to be caught by someone. For Gomez, though, it looks like he’ll finally have some closure to this Easter Sunday saga…and in time for Mothers Day — and Kyle Lohse Bobblehead Day. Welcome back in to “Brewers By the (Jersey) Numbers”! I hope this day finds you well, if cold here in Milwaukee. Despite being listed at 5’7″ tall on most sites, Caleb Charles Gindl is actually 5’9″. He bats left-handed and hails from Pensacola, Florida. 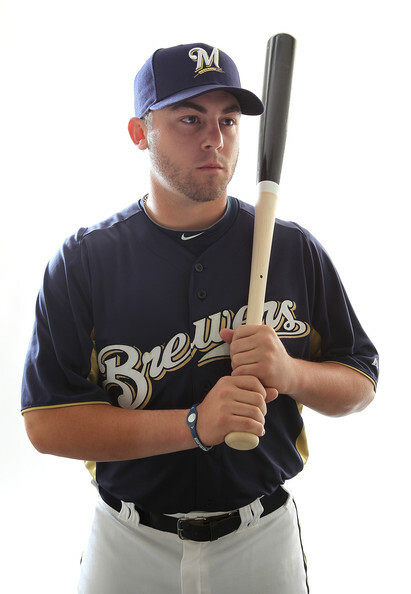 The Brewers drafted Gindl in the fifth round of the 2007 First-Year Player Draft and, as I told you last year in this space, his rise through the minor leagues was steady up until repeating Class-AAA Nashville due to there being no openings on the 25-man roster. Gindl had a bit of a down year by his standards in 2012 but still came to camp last year as a non-roster invitee. And while he didn’t make the team, he impressed the Brewers brass enough (.273 AVG, 4 SB) that they had him on their list of potential call-ups last year. Unfortunately, Gindl then got off to a rough start with Nashville, a plague that seemed to permeate much of that roster. But with a BABIP of just .250 in April, Gindl struggled to a .208/.311/.390 slash line. Not exactly confidence-inspiring. 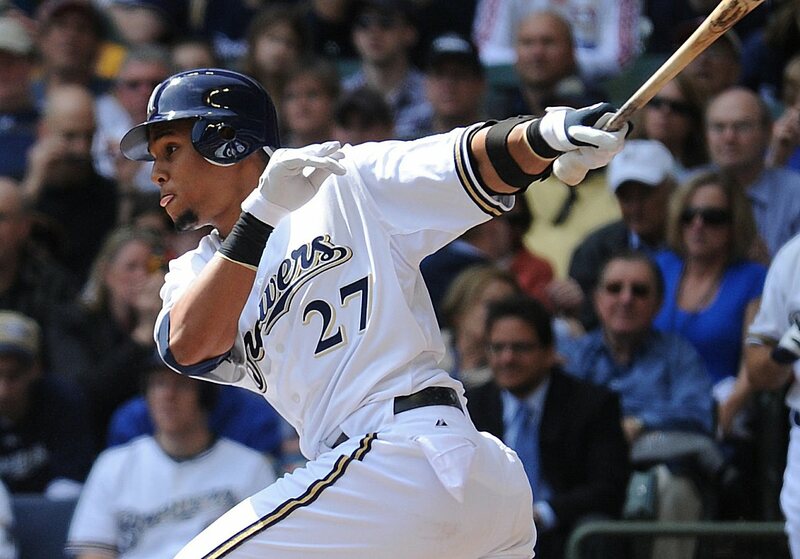 So when the Brewers needed a bat called up, they once again tapped Khris Davis first. 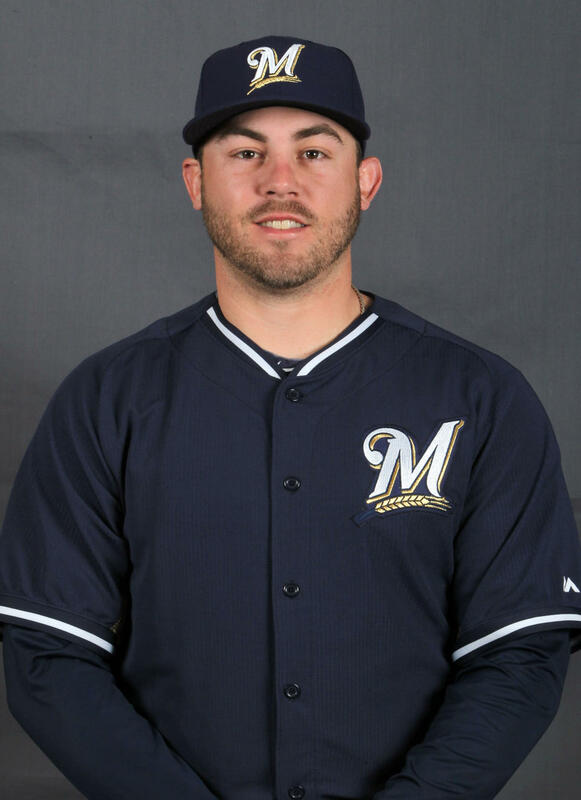 Gindl continued to grind and wound up at .274/.341/.456 with eight home runs and 38 RBI over 64 games in Nashville, but the crowning moment was when he finally got the call to head to Milwaukee in mid-July when Ryan Braun finally hit the disabled list with his thumb issues. Overall in 2013 with Milwaukee, Gindl amassed a .242/.340/.439 slash line with 32 hits (14 for extra bases), 17 runs scored, five home runs, 20 walks and 25 strikeouts in 132 at-bats across 57 games. It was a year of ups and downs for the now 25-year-old Gindl. He would be recalled on three separate occasions during 2013 and would finish the season on Milwaukee’s bench. For 2014, Gindl came to camp as the likeliest choice for fifth outfielder behind the presumed starters (Davis, Braun, and Carlos Gomez) and the second-best defender of the group, Logan Schafer. Gindl has gotten off to a slow start in Cactus League play however, though they may not have the room on the 25-man roster for a fifth outfielder to start the year anyway. As a result of several mitigating factors, Gindl is likely to begin 2014 stashed away at Triple-A for at least the short-term. He’ll have the opportunity to get his swing going and could certainly see time this year against some tougher right-handed pitchers at the big league level depending on how things line up both in terms of opponent and situation. All he’ll truly have to do is what he’s always done: Hit and play solid, if not spectacular, defense. Something tells me he’s up to the task.